We are going to compare three cruising 40-footers this month. Two are similar but the Indikon is a catamaran so by virtue of its two hulls it's not similar. The design is by Morrelli and Melvin. The company is at the top of its game when it comes to cat design, and its boats have proven their effectiveness and performance many times over. 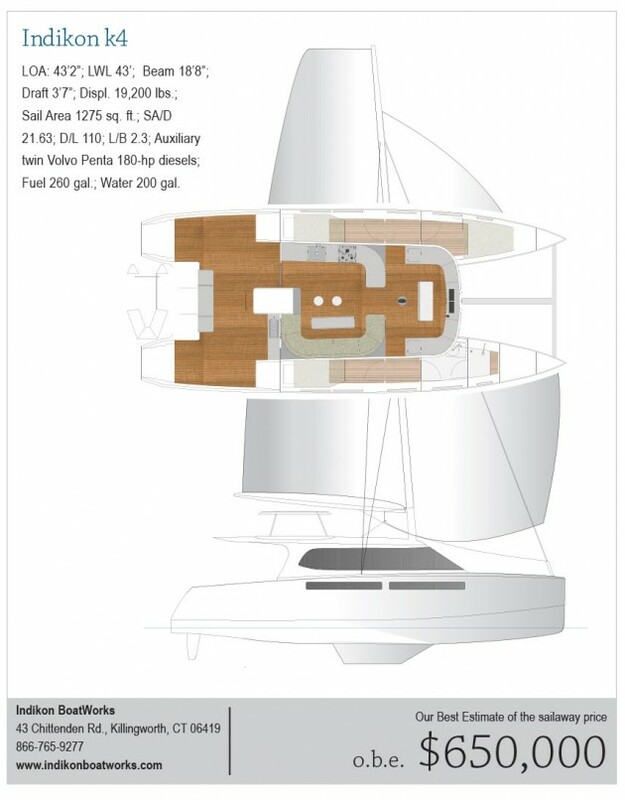 The design combines the quest for speed under sail with comfort and speed under power. With twin 180-horsepower diesels to push it along, speed in light air will never be an issue. Unless you run out of fuel. Length overall is 43 feet 2 inches and pretty much all of that is waterline. There are no overhangs at all. In fact the transoms are sunk below the DWL to increase prismatic coefficient and help with the speed under power. I see also that there is a hook in the run that also helps pull volume aft and hopefully prevents the stern from squatting at speed. The L/B of this cat is 2.3. The hulls have a spray knocker molded in that runs full length. By my estimate the height of the bridgedeck-I guess that's what it's called on a cat which sounds better then "slam pan"-is 28 inches above the DWL. This is not a light cat. The D/L is 110 so it is definitely lighter for its length than the two monohulls this month. Obviously for upwind speed daggerboards are the best way to go on a cat but they interfere with the accommodations and they have their own specific maintenance issues and vulnerabilities. But at least these fixed keels have some aspect ratio to them and draft is still a modest 3 feet 7 inches. With a square-topped mainsail we need to use all of that area for the total sail area figure. Using P and E won't cut it on a rig like this. So, using the area of the working jib I get a SA/D of 21.63. That's a pretty high number for a cruising boat. I think this will be one cruising cat that can get out of its own way. There are several interior layout options. I'll focus on one version for this review. With the combination of powerboat features to this design there is an inside helm on the centerline forward of the saloon area. The helm is flanked by large storage bins with enough countertop to them to use for laying out charts, if anyone does that anymore. Aft of this area there is a dinette to port and a large galley stretching down the port side. The dinette is also a pull-out berth. I tend to think the cockpit should be included in the accommodations because a lot of living will go on in this very spacious cockpit. If you raft up your Indikon with some monohull cruising buddies you can bet the party will be on your boat. There are staterooms in both hulls and I suspect that the berths are all double berths. There is one head and it's forward in the starboard hull and has a walk in shower stall. One stateroom is aft in the starboard hull and there are two in the port hull. Fuel capacity is 260 gallons, so those two big diesels will have plenty to drink as you motor along, steering from that elevated and covered steering station over the cockpit. This is another one of those hybrid power and sail ideas that make this design very interesting.